This space wallpaper shows an aerial view of the Chajnantor Plateau, located at an altitude of 5000 meters in the Chilean Andes, where the array of ALMA antennas is located. 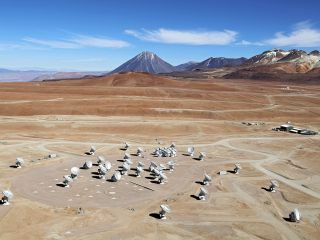 The Atacama Large Millimeter/submillimeter Array (ALMA) is a telescope array in Chile that includes 66 receivers. The array is located on the Chajnantor Plateau in the Atacama Desert. The ALMA website calls the array "the largest astronomical project in existence." NASA calls it "the most powerful Earth observatory in history." ALMA studies the universe in certain radio wavelengths that range from millimeter to submillimeter wavelengths. This capability means it can examine several things that are difficult to see in visible wavelengths, such as planetary systems under construction, which are usually obscured by clouds of dust. ALMA can also look at some of the most distant and oldest galaxies in the universe. This image from ALMA shows the distribution of molecular gas close to the supermassive black hole at the centre of the galaxy NGC 1433. Image released Oct. 16, 2013. ALMA is a partnership among the European Southern Observatory, the United States' National Radio Astronomy Observatory, and the National Astronomical Observatory of Japan, in collaboration with the republic of Chile. ALMA brings together three separate proposed projects initially considered for observations in millimeter and submillimeter wavelengths, according to the ALMA website. The concepts were the Millimeter Array (MMA) of the United States, the Large Southern Array (LSA) of the European Southern Observatory and the Large Millimeter Array (LMA) of the National Astronomical Observatory of Japan. ALMA's extreme altitude is an aid in performing observations. Its highest receivers are about 16,500 feet (5,000 meters) above sea level, far above much of the atmosphere and water vapor that can make it hard to see what's in the sky. Astronomers work in a facility at 9,500 feet (2,900 m), where they receive supplemental oxygen if they are going to stay awhile. The 66 ALMA antennas can be arranged in many different configurations, ranging from very close together to quite spread apart. At its greatest, the receivers can be moved as far as 9.9 miles (16 kilometers) apart. Each telescope receives information individually, and then transmits the data to a supercomputer that combines the information to trace the signal direction — a high-tech version of how a human's two ears combine to locate a sound. This technology allows astronomers to look at three principal questions, according to ALMA's website: the nature of the universe's first stars and galaxies, how planets and stars come together, and the chemistry of gas and dust clouds that may eventually collapse to form planets and stars. ALMA is a productive scientific observatory that has produced many results, so this is a sampling of some of its findings. The first image from ALMA was a combined view of the Antennae Galaxies, which are about 75 million light-years from Earth. Another early image peered through dust surrounding the Centaurus A galaxy to show the galaxy's bright center. The telescope is also capable of producing three-dimensional visualizations of gas, such as an image of NGC 253 (the Sculptor Galaxy) released in 2013. Made up of dozens of small radio telescope dishes, the ALMA telescope will be one of the most powerful in the world. See how the giant ALMA radio telescope works in this Space.com infographic. In 2014, ALMA examined a famed supernova remnant — the leftovers of supernova 1987A — and found dust spewing in the area. "We have found a remarkably large dust mass concentrated in the central part of the ejecta from a relatively young and nearby supernova," astronomer Remy Indebetouw, of NRAO and the University of Virginia, said in a statement. "This is the first time we've been able to really image where the dust has formed, which is important in understanding the evolution of galaxies." That same year, ALMA participated in a series of observations of a galaxy collision about 7 billion light-years from Earth, using a phenomenon called gravitational lensing that allows faraway objects to be seen when a galaxy or other large object bends and enhances the light from fainter objects behind it. A baby star was captured on camera in 2013. The image showed the youngster blasting out material at 84,477 mph (144,000 km/h). Once the material crashed into the surrounding gas, it produced a glow. This could provide some clues as to how the sun came together, astronomers said at the time. "The sun is a star, so if we want to understand how our solar system was created, we need to understand how stars are formed," Héctor Arce, the lead author of the Astrophysical Journal study, said in a statement. In one planetary find, ALMA spotted cometary swarms around the star Beta Pictoris. In results released in 2014, astronomers concluded that these comets were trapped in place by an unseen exoplanet. Some of its other finds include helping confirm the object "DeeDee," which orbits the sun from 38 to 180 astronomical units (AU), qualified as a dwarf planet in 2017, which makes it similar in size to the planet Pluto and other objects in that category. Specifically, ALMA's observations showed the heat signature of DeeDee, which is proportional to the size of the world. ALMA's planetary findings that year also extended well beyond Earth, when it spotted gaps in the rings around some young stars and assisted with the conclusion that these gaps are caused by a super-Earth.